You’ve got to sing it to win it! You may be surprised to know, that these type of games aren’t my thing. I don’t aspire to be the next Whitney Houston. Not yet anyway. But when the editors asked me to review this, I thought I’d do it a bit different compared to previous reviews. Let’s Sing is, surprisingly, a karaoke game where yourself and up to three other friends, forced or otherwise will join you in singing away. There are thirty tracks available, and just looking on Amazon UK and other store sites, they offer the game for £100. I’ll type that again: One… Hundred… Pounds. This includes just the game and the microphone, and to put it mildly, it seems overpriced, but if you live in a house-share, you’re all on good terms and share the bills, £20 each to put into this may be a good method of purchasing this. Alternatively, you can buy the game from the eShop for £35, and use your smartphone to download the ‘Lets Sing’ app, which turns it into a microphone. It’s easy to set up and it works fine, but if you sit next to one another, the game will become confused as to who is singing what, so make sure you are sat away from each other. Now, you may be aware I have a podcast, and I use a USB microphone, but since the Switch itself only has USB-C, I thought I had to order a USB to USB-C adapter for the microphone to work. Only, it seemed to try to output the sound to the microphone instead, completely doing the opposite. I tried the same for the USB port in the dock, but the result was the same, eventually after a few false starts by using the app, it all worked in the end. Each of them offers a fun time and they do keep the longevity going. Over this past year, I’ve been starting to bring my Switch dock with me for wherever I may be staying, and for when it’s a group of us friends, it works out much better than just crowding around a 7-inch screen. 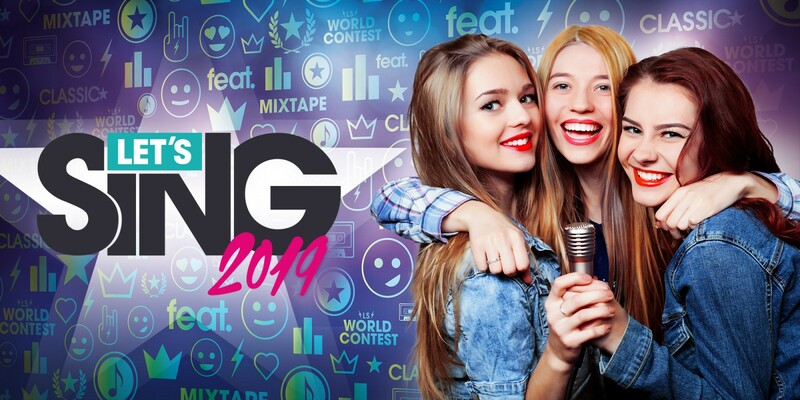 World Tour is the online mode, where you can compete against other potential singers, whereas the others are essentially the same mode. MixTape is singing a few bars of different tracks, Classics is just singing a track, and Feat is VS. Mode with a friend or 3! The more tracks you pass, the more points you gain to level up, and able to use the tracks in other modes. Simple enough, and for a multiplayer-focused game, it does the job. On the main screen, there is also a link that can take you to the eShop, where you can purchase many music packs, from a 90’s greatest hits to a dance collection. All of these can be used to your heart’s content, or as a very expensive jukebox to play as you get some errands done. However, I do find it strange that for the time of year it came out, there’s no Christmas Classics such as Wham, Wizzard and even The Darkness. To have that available to play on Xmas day for someone who has unwrapped a Switch and this game, it would be perfect to play across the family after Xmas dinner. Now, I could go on about how the experience is when singing, but I’ve gone one step further, and recorded a little video for your viewing pleasure to see for yourself how the game plays a song, and how blown away you’re going to be by the singing. For the worse. As you can see, the interface helps you enough, and if you make a bad job throughout, it doesn’t do a ‘Guitar Hero’ and stops you from trying any further. It just makes you carry on, which is a nice touch. Overall, it’s a fine game, and it does its job. It’s primarily a game to be played with friends at a house somewhere. If you start singing at a coffee house through your smartphone, you may not be welcome there again. The price may put you off but on the eShop, for the catalogue it offers, it’s reasonable. I do hope that there’s more DLC down the road that can extend the longevity of the game. But for now, you can try and see if you can stand alongside the Spice Girls when they tour in June.